I don't ever remember "shopping" for toys for my oldest, Laila. We didn't really "shop" at all. It was a much simpler process --we saw, we bought, we conquered. With Ceci, on the other hand, before we buy a toy, we "shop" -- we research, we read, and then we research some more. #1. 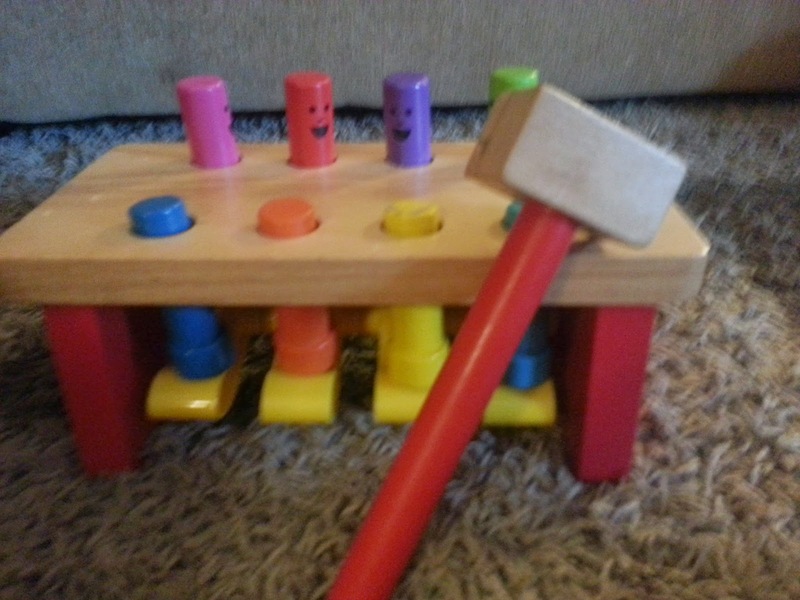 The Hammer Sets - Both of these toys are wooden hammer sets from Melissa and Doug. I absolutely love their toys because the quality is great and they are so durable, and both my girls enjoy them too. 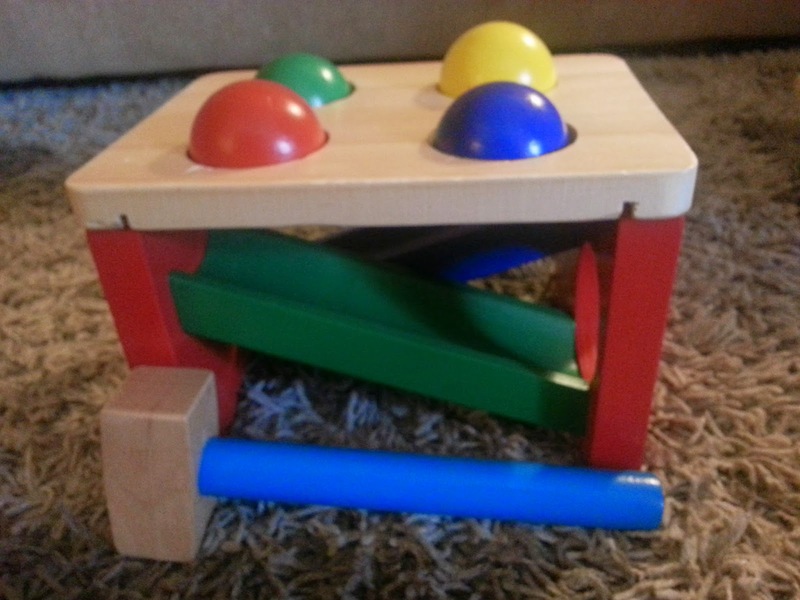 Ceci loves playing with this toy, and it is great for her fine motor skills. The mom in me pink puffy heart loves this one because the pegs are attached (aka one less small, random toy piece that I have to keep track of.) The downside is that because the pegs are attached, it does not require her to use her fine motor skills to place the pegs back into the holes. The toy is coloful and when hit with JUST the right amount of force, loud...which is another win in Ceci's book. Of the two hammer sets, this one is my favorite. Instead of having pegs, the set has balls. When they are hit with the hammer, they roll out of their spot up top. Not only does Ceci have to place the balls back where they belong, but this set requires her to activate her gross motor skills too, because she has to retrieve the balls too. We make a game out of it. We walk to them. We run to them. We jump to them. And then place them back where they go and start all over again. Bonus: This set is NOT as loud as the one pictured above. That's a win in MY book. #2. 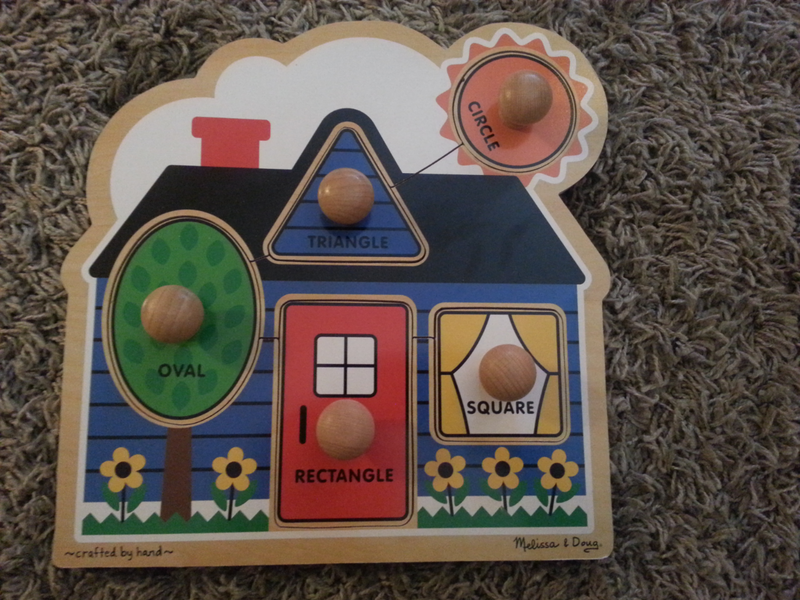 Shape Puzzle - This is also by Melissa and Doug. I am a huge fan of this toy because it is so very versatile. The pieces are easy to manipulate, so Ceci has a relatively simple time placing the pieces where they go. I also like that the puzzle lends itself to practicing shapes and colors as well. There are multiple pieces, so it keeps Ceci entertained for long stretches of time. The only negative is that those multiple pieces means more for mom to clean up and keep track of...we have not lost any yet! #3. Puzzle With Knobs - Another Melissa and Doug piece. Can you tell I am a fan yet?! We have bought different puzzles for Ceci in the past, but this one is her most requested. The large knobs on the pieces allow her to place the pieces in their spots with ease, and this allows her to feel successful. Each time we play with the puzzle, she is cheering and clapping for herself, and as a mom, it is rewarding to see your child feel proud and accomplished. I also like that fact the this puzzle, once again, involves shapes AND words. We practice saying the shape and the items that are pictures on the puzzle...the door, the sun, etc. We also talk about colors when using this toy. #4. 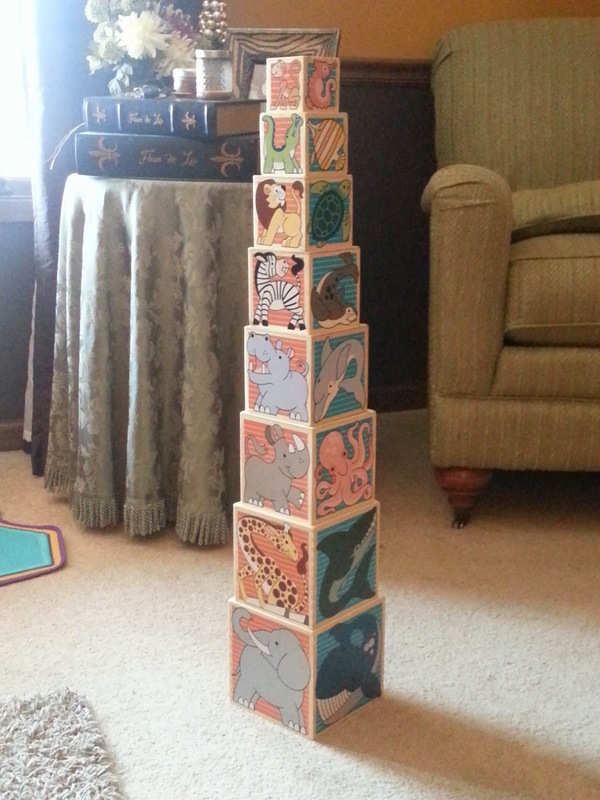 Stacking Blocks - If you guessed Melissa and Doug, you are right. There is so much I love about these stacking blocks. I am a fan of the fact that they require Ceci to use her gross motor skills -- she has to go from sitting to kneeling to standing in order to play with them. And once she places the final blocks, she knocks them all over and we start again. It is a great workout! I also love the fact that the blocks are sortable -- by color and by animal habitat. All the orange jungle animals go together, all the blue sea animals, etc. I feel like this added element will still peak her interest as she gets older. And I love a toy that has staying power. #5. 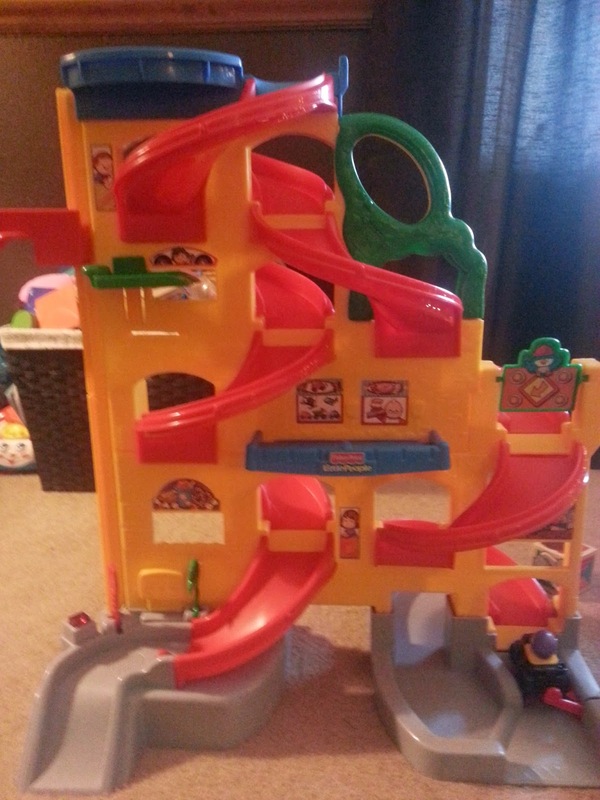 Little People Car Track - This toy is manufactured by Fischer-Price, and it takes me back to the '80's and my toddler years. Who does not a love a good Little People toy?! Much like the previous toy, this car track encourages Ceci to move, to reach, and to play while standing. It also has staying power. My seven year old enjoys playing with it, and because there are two roadways, we like to do "experiments." Will the heaviest car reach the bottom quicker? Does the length of a car affect its speed? The ideas are endless. Laila even once tried to see if a banana could travel quicker than a car. It is a great buy. #6. 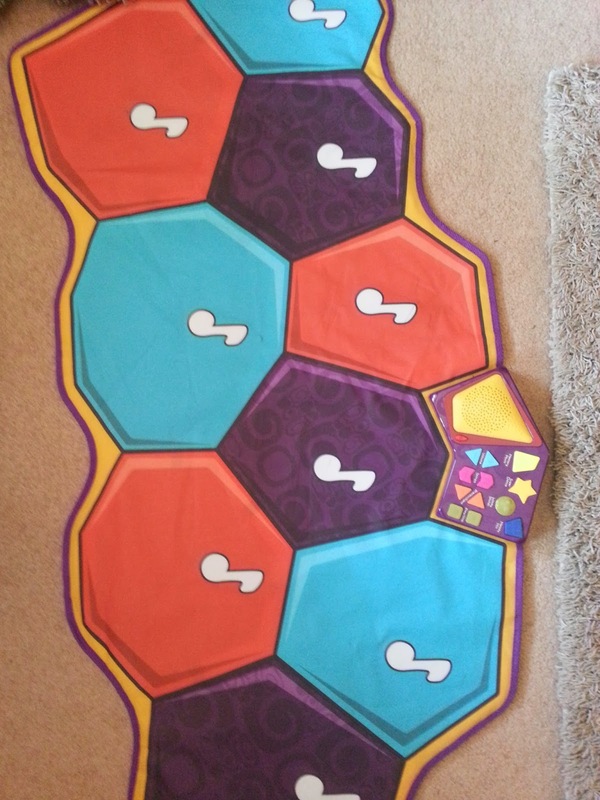 Music Mat - This beauty is from B.Toys. We do silly in our house. We do breakfast for dinner. We do belly laughs. And we do DANCE PARTIES, and this toy has been a welcome additon. This is a toy that gets both of my girls up and moving. There is music, there is lights, and there are so many options! My girls like to have dance offs, play Memory Music (a feature included on the toy), and try to make music with random parts of their bodies -- their elbows, their heads -- the wackier, the better. #7. Stacking Counter - Hape is the creator of this final gem! 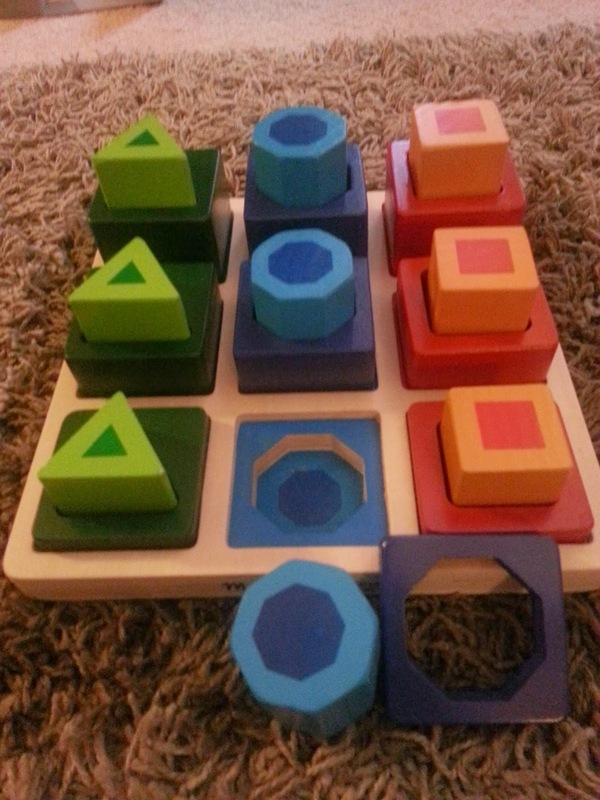 Like many of the other toys, it serves multiple purposes -- colors, counting, and fine motor. I love that this toy challenges Ceci's fine motor skills, while still allowing her to experience success. 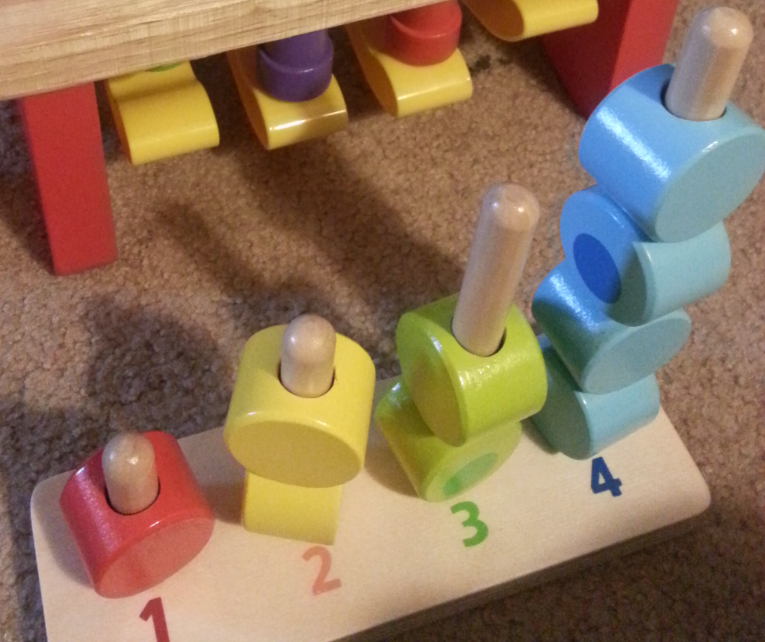 The wooden pegs that the blocks go onto are soft and bendable, so if she struggles trying to place a block, she can easily bend the peg down in order to get the block on. And for only 10 dollars, it is a steal!! !